Surviving an early crash, along with wind and rain blanketing much of Europe, Nacer Bouhanni took an eye-opening win in the French national road race championship, outdueling trade team-mate Arnaud Démare and Adrien Petit (Cofidis) in the fast finale. The biggest win of the 21-year-old’s short career was his second victory in a week, after he took Halle-Ingooigem on Wednesday. That sprint win was indeed an indication of Bouhanni’s current capabilities, and the Frenchman used a smartly timed finish to come around Démare in the final hundred meters. “I cannot believe it. 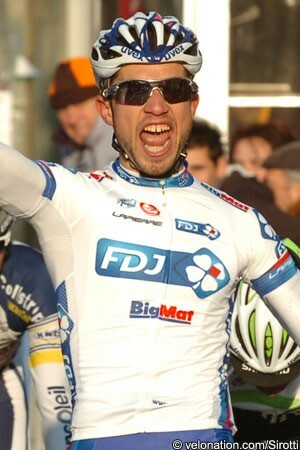 I’ve won the French championship and I’m not even 22 years old yet,” Bouhanni gushed to L’Equipe after the race. “In addition, there is also the FDJ-BigMat double. You could not ask for more. Bouhanni and 115 others out of 173 starters were able to brave the elements for the entire 256 kilometers around Saint-Amand-les-Eaux. The start line was missing one rider however, as Mickaël Delage (FDJ-BigMat) was denied the start due to abnormal blood values. Team manager Marc Madiot said that Delage had been prescribed an inhaler for bronchial issues after the Giro d’Italia, unaware that it could cause an issue. On course, an 18km circuit was covered 14 times, and to almost no surprise at all, the slashing Alexandre Geniez (Argos-Shimano) was the first to attack. He was unable to escape, and finally after 41km, Sandy Casar (FDJ-BigMat), Christophe Riblon (AG2R-La Mondiale), Cyril Gautier (Europcar), Cyril Bessy (Saur-Sojasun), Gaël Malacarne (Bretagne-Schuller), and Gaylord Cumont (Veranda Rideau-Super U) achieved a small gap. But the gap remained slight, and forty kilometers later, it was gruppo compacto again. Later, a massive 21-man group got off the front, including many from the initial break, and the peloton gave them space this time, and the gap expanded to 2’20”. David Moncoutie (Cofidis) and Sylvain Georges (AG2R-La Mondiale) climbed off as the pace picked up again and the big escape was reeled in. For the next nearly hundred kilometers, other escapees tried the spring the one that may finally stick. But FDJ-BigMat used their super-allotment of nearly 20 riders to control the main bunch, keeping everything within range. With 30km to race, a scary trio made their bid, as escape artists Sylvain Chavanel (Omega Pharma-Quick Step) and Jeremy Roy (FDJ-BigMat) went away with Laurent Pinchon (Bretagne-Schuller). The move had promise, but eight kilometers later, Pinchon lost his front wheel in the wet and took down Roy with him. The two were unhurt but the move was done, although Chavanel made a brief attempt to go it alone. As the bunch geared up for the sprint, Saur-Sojasun lost their primary hope for the title, as in-form rider Stephane Poulhiès crashed. Three roundabouts threatened in the final kilometre, but the screaming bunch negotiated them properly. Into the final thousand meters, William Bonnet (FDJ-BigMat) led Démare and Bouhanni. Démare kicked with 250 meters to go, but Bouhanni was on him, and the “elder” Frenchman came around the 20-year-old Démare to grab his first French title. Yesterday, Marion Rousse (Vienne Futuroscope) continued the perception that the guard is changing in French cycling, with the shift towards youth seen in the time trial continuing with her victory. The 20 year old outsprinted Julie Krasniak (Lorraine), with Fanny Riberot (Lointek) leading home a ten-woman chase group 22 seconds later. Multiple French champion Jeannie Longo (Rhone Alpes) was last of this selection, netting twelfth.